In her first campaign rally since announcing that she was running to be nominated the Democrat’s candidate for president in 2016, former US Secretary of State Hillary Clinton drew on her family experience and the achievements of 20th Century Americans to outline her commitment to regenerating the economy and empowering the middle class. But Republicans immediately lashed out at the Democratic hopeful following her speech and said she was out of touch with reality. They said her presidency would be tantamount to a third term for current US President Barack Obama. Addressing her supporters – her speech was carried live on most cable news networks – at the Roosevelt Island memorial site for late President Franklin D. Roosevelt in New York, Clinton referenced his economic policies and how he was able to pull the US out of a depression ahead of World War II. She used the example to allude to her husband – former US President Bill Clinton – and his policy of turning around a recession-hit economy in 1994 and creating a large surplus. This surplus was wasted by the Republicans she said. She compared former President Clinton to Roosevelt saying they were “two Democrats guided by the fundamental American belief that real and lasting prosperity must be built by all and shared by all”. She appeared to be saying that she wanted to return the democratic party to its modern 20th Century roots and by doing so fulfill its promises to create a prosperous America for all. She also applauded current Obama for turning the 2007-2008 subprime mortgage crisis around and introducing policies which have led to a drastically reduced unemployment rate. Following the 2008 financial crisis, which eventually became a global issue, the US unemployment rate rose to peak at 10 per cent in October 2009. It is currently at 5.5 per cent, considered a healthy economic indicator by the Federal Reserve. The Fed is expected to raise interest rates in September, the first time in nearly seven years. Clinton went on to swipe at the Republican party and its economic policy saying it raised incomes for the top 5 per cent of Americans at a rate far higher than for the lowest 20 per cent of the labor force. She said that while the Republicans cut taxes for the wealthy, family income was suffering. She spoke of her mother, a house maid, who succeeded because of kindness of strangers. Someone believed in my mother, she said, and this made my mother believe in me. The former Secretary of State promised to ensure that all women are paid fairly and equitably to their male counterparts. Clinton promised to work for a more inclusive America and chided Republicans for believing in an old, antiquated system. But both Democrats and Republicans have criticized Clinton’s policies. 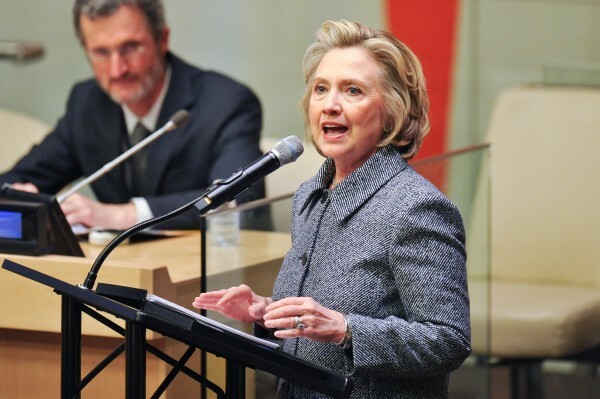 Republican-turned-Democrat former Senator Lincoln Chaffee criticized Clinton for voting for the Iraq war in 2003 and then changing tone and acting against it. Clinton told reporters last month that she regretted voting for the war. Immediately after her speech, Republicans said America did not need an extension of Obama’s “failed policies” in a Clinton presidency. They said America needs fresh ideas and solutions. A Republican National Committee spokesperson said Clinton did not sufficiently address US foreign policy. Other Republican leaders have accused her of avoiding the media. Last week, Clinton opened an instagram account with the first picture of her wardrobe options ahead of her rally on Saturday.